The Randall Museum in San Francisco hosts a large HO-scale model train layout. 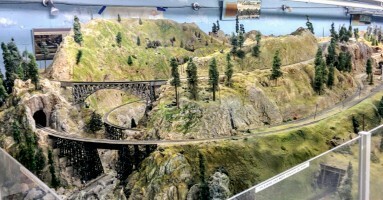 The layout was built by the Golden Gate Model Railroad Club -- in 1961 the Club was offered space in the basement of the Randall Museum in San Francisco, where it has been to this day. The layout is the result of more than fifty years’ effort to create a railroad in miniature with the communities it serves and combined with engineering and geographical features found on railroads in California. It features snowsheds on the high mountain line, various types of bridges spanning canyons on the Mountain Division and a narrow gauge line. The layout is HO scale and is contained in a room measuring 57 feet long by 38 feet wide. The mainline is about 600 feet long (nearly 10 scale miles), with an additional 200 feet or so of sidings and passing tracks (see below for the track plan). 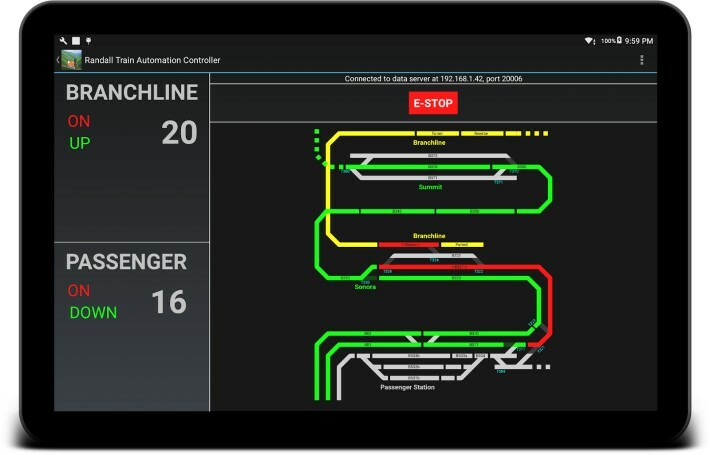 The layout originally operated fully in DC with a state-of-the-art multi-throttle setup and centralized dispatch towers. Shortly after the 2010’s, the layout was converted to operate both in DC and DCC. In 2015 the Randall Museum closed for two years of renovation. At that time, the Club donated the layout to the Museum. Upon reopening in 2018, the layout is fully operating in DCC with some parts of the track being automated. The Randall Museum is located at 199 Museum Way, San Francisco, California 94114. The museum is open from 10 AM to 5 PM, Tuesday to Saturday. Note that it is closed on Sundays and Mondays. The layout is located in the basement. An elevator is available. From Tuesday to Friday, the layout works in automated mode. Trains run at regular interval. On most Saturdays, volunteer operators come and run their own trains, depending on availability. If you wish to volunteer to help improve and operate trains on the Randall Model Railroad, please contact Volunteer Coordinator Jim Evans at FiveChime@AOL.com. Volunteers need to be at least 16 years old and be cleared by a Life Scan check performed by the San Francisco Recreation & Park Department. The layout is mostly a freelance layout with some roots in history of California Railroads. All the towns on the layout represent California towns: Napa, Richmond, Fairfield, Lodi, Stockton, Sonora, Summit, and Bridgeport. To know more, read Our own SN&P RR: Route and Historical Scenario of the Sierra Nevada & Pacific Railroad on the old ggmrc web site. Details on the current software automation. I would like to personally thank the following individuals for their contribution to our effort to restore the layout. Scenery refresh: Greg and Claudette Ockander, Mike Garrigan, Robert Lopez, Jim Willcox. Coordinators & Artistic Direction (a.k.a. “keeping the trains somewhat prototype”): Jim Evans. Electrical, Computers, and track repairs: Raphaël Moll. I’d also like to thank Chris Boettcher, the Randall Museum director, and Nathan Robinson, of the Randall Museum Friends, for their support. Link to the legacy GGMRC web site (no longer updated).